Comparable store sales, or same-store sales, are a measurement of productivity in revenue used to compare sales of retail stores that have been open for a year or more. Historical sales data allows retailers to compare this year's sales in their store to the same period last year. This is a more effective measurement of performance than comparing one-quarter of sales to the previous quarter because it shows the degree of revenue growth (or decline) to a similar period. For instance, to look at February 2013 same-store sales and December 2013 figures would not be an apples-to-apples comparison. The busiest retail period of the year is, of course, the holiday shopping season, so December's numbers are likely to be much higher (at least one would hope) than any other month's sales. A more accurate comparison would be to look at December 2012 figures against December 2013 figures. The conditions are as similar as can be reasonably expected, that is, as long as the store has been open for at least a year. Newer stores, even as part of a prominent retail chain, are likely to have either higher-than-expected revenue, due to "grand opening" and other promotions or lower-than-expected because the store needs time to build a clientele. Here's an example of how the data might be applied to a explain a real-world scenario: If a large electronics retailer showed significant comp-store sales growth of 5.9 percent year-over-year, that's a healthy indication that the existing stores are performing well. Whether or not that growth was fueled by trends such as sales of flat-panel TVs in one-quarter and laptop computers the previous quarter is worth noting. But the underlying strength of the company shows no matter what the trends, the existing stores are healthy. Comp store sales are a valuable measure not only of individual stores performance but of the overall financial health of a retailer. Looking at same-store sales across the company can give a picture of how a chain that is expanding rapidly is really performing. Their new stores might temporarily boost (or lower) the overall revenue figures but is that really evidence that a company is improving or declining? 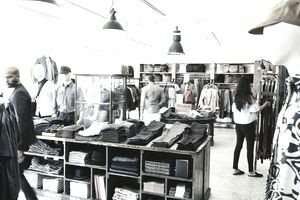 A more accurate comparison can be found by looking at existing same-store sales and identifying trends there. In some cases, a chain that has opened too many new stores too quickly might be in a lot more financial difficulty that the new stores' revenue boost indicates. If there's a long pattern of decline in same-store sales over a period of several quarters or even years, this may indicate a company has run out of room to expand despite opening new stores. While a large chain retailer wants all its stores to perform as well as possible, existing stores may be neglected or even cannibalized by new stores. While the company is tending to the needs of its new stores and spending resources to publicize and have promotional events, it has to take care not to siphon resources away from its existing locations. That's another business scenario most companies want to avoid.